An extraordinary journey has begun for a group of artists from the Barkly region who have been invited to showcase their work at Tandanya. Tying in with Tandanya’s 20th Anniversary celebrations this year, a two-year exhibition in the making, Artists of the Barkly, will officially be launched 12 August. The seeds for an exhibition were planted way back in December 2007 when a group of 10 Aboriginal women artists from Julalikari Arts in Tennant Creek, NT, sat down with staff and management from Tandanya. Representing five different language groups from the Barkly region, the women were on a professional development and arts industry study tour of public and private galleries, cultural institutions, Indigenous art collections and art schools. Despite being somewhat bewildered by the sight of people openly drinking alcohol on footpath tables, embarrassed by the immodesty of Adelaide summer attire, and homesick for their country, the women absorbed an enormous amount of arts business information and cultural understanding. From there discussions between Tandanya and Barkly Regional Arts, which represents artists and art centres throughout the Barkly, began in earnest last year. “Artists in the area were eager to join with Tandanya to help celebrate its 20 years of arts engagement and support for Aboriginal people. They also saw an opportunity to tell their story through their most effective medium, the arts,” said Alan Murn, Barkly Regional Arts CEO. In mounting this exhibition, both Barkly Regional Arts and Tandanya have been mindful to represent the artistic landscape of around 11 different language areas of the Barkly honestly and transparently. Selection was not about artistic excellence alone. “We have presented a collection that represents long and short-term art centre support, larger communities with established arts networks, artists who have accessed arts skills training, or artists from small remote outstations who might simply be a couple of families painting together,” said Mr Murn. Mr Murn added that the exhibition is about telling the regional story and offering a visual conduit to assist their audience ‘down south’ to understand. “We gotta help them whitefellas understand,” said Annie Grant, Julalikari Arts, Tennant Creek , NT. The journey to Tandanya has been long. 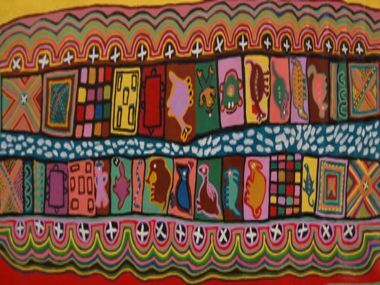 But the truly remarkable facet of the journey is that a group of Aboriginal artists have worked together across the traditional language and cultural complexities to proudly bring their collective story of reconciliation and diversity.